Friends, the post which follows was written following the events in Orlando last summer – I didn’t have the courage of my convictions to post it at the time partly as I know Christian friends, US citizens, who felt very strongly about their constitutional right to own guns. After the events in Las Vegas this past weekend, I cannot hold back publishing any longer. For ‘Orlando’ you could easily read ‘Las Vegas’. Friends in the USA, what follows is not my usual style of post, but the events in Orlando on Sunday, and the reaction I have seen to this atrocity both in the media and amongst the blogging community have prompted me to write. I have paused 24 hours, I have considered the fact that this is a highly emotive subject in your country, and that many who read this will continue to fiercely defend their constitutional right to own firearms. My only intention is to invite pause for thought, although my hope is that highlighting these shocking statistics will apply that thought to action. I have read clichéd suggestions that “guns don’t kill, people do”. The evil in men’s hearts is certainly the ultimate cause of this and other gun-related murders; but why would you allow the evil in a maniac’s heart to be coupled with a lawfully-purchased murderous weapon in his hands? My thoughts and prayers are with the families of the victims, the city of Orlando, and a nation which, I would humbly suggest, cannot continue to ignore the appalling impact of guns on its society. The type of AR-15 rifle that terrorist Omar Mateen used to kill 49 people and wound dozens more in Orlando has has been used in multiple shootings during this decade alone, yet the military-inspired semi-automatic rifle designed for civilian use is perfectly legal in most states. FACT: There were 372 mass shootings in the US in 2015, killing 475 people and wounding 1,870, according to the Mass Shooting Tracker, which catalogues such incidents (a mass shooting is defined as a single shooting incident which kills or injures four or more people, including the assailant). Mateen was armed with a .223-caliber AR-15-type rifle and a 9mm semi-automatic pistol – both legally purchased – when he opened fire at the Pulse club in Orlando early Sunday morning. FACT: The US spends more than a trillion dollars per year defending itself against terrorism, which kills a tiny fraction of the number of people killed by ordinary gun crime. According to figures from the US Department of Justice and the Council on Foreign Affairs, 11,385 people died on average annually in firearm incidents in the US between 2001 and 2011. In the same period, an average of 517 people were killed annually in terror-related incidents. Removing 2001, when 9/11 occurred, from the calculation produces an annual average of just 31. The AR-15 rifle is the civilian version of the fully-automatic M16 used by soldiers in the Vietnam War. Unlike the M16, users must pull the trigger every time they want to fire a shot. The most common versions of the AR-15 have been banned in a handful of states, including California. FACT: There were 64 school shootings in 2015, according to a dedicated campaign group set up in the wake of the Sandy Hook elementary school massacre in Connecticut in 2012 (including occasions when a gun was fired but no-one was hurt). The National Shooting Sports Foundation, which represents gun manufacturers, said there are five million to 10 million AR-15 rifles in the U.S., a small percentage of the 300 million firearms owned by about a third of the US population. That is nearly enough guns for every man, woman and child in the country. FACT: Some 13,286 people were killed in the US by firearms in 2015, according to the Gun Violence Archive, and 26,819 people were injured [those figures exclude suicide]. Those figures are likely to rise by several hundred, once incidents in the final week of the year are counted. 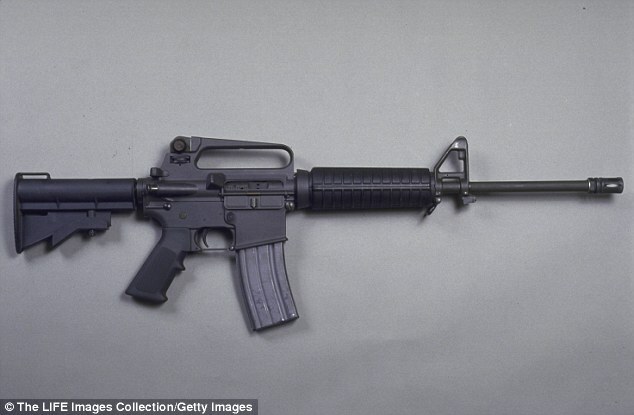 Last October, gunman Chris Harper-Mercer, 26, used an AR-15-style firearm to kill nine people before he killed himself at Umpqua Community College in Roseburg, Oregon. An AR-15 model was used by married couple Syed Rizwan Farook, 28, and Tashfeen Malik, 29, when they killed 14 people and wounded nearly two dozen others at a work Christmas party in San Bernardino, California, last December. Police recovered two .223-caliber AR-15-type semi-automatic rifles after the couple died in a shootout with officers. An AR-15-type firearm was used by 20-year-old Adam Lanza in the Sandy Hook Elementary School shooting in Newtown, Connecticut, which shocked the nation in December 2012. Lanza fatally shot his mother, Nancy, who legally obtained the firearms, at their home before he killed 20 children and six adult staff members at the school. “It was designed for the United States military to do to enemies of war exactly what it did [in Orlando]: kill mass numbers of people with maximum efficiency and ease,” said lawyer Josh Koskoff, who is representing families of the Sandy Hook victims in a lawsuit, when interviewed by the New York Daily News. That shooting renewed the gun debate in the USA, and led to calls for a ban on sales of AR-15-type firearms. However, sales went through the roof, and the National Rifle Association boasted that its membership surged to around five million. FACT: The number of gun murders per capita in the US in 2012 – the most recent year for comparable statistics – was nearly 30 times that in the UK, at 2.9 per 100,000 compared with just 0.1. 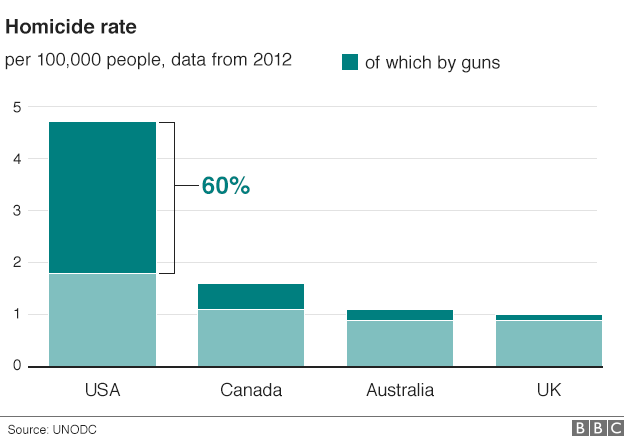 Of all the murders in the USA in 2012, 60% were by firearm compared with 31% in Canada, 18.2% in Australia, and just 10% in the UK. FACT: So many people die annually from gunfire in the USA that the death toll between 1968 and 2011 eclipses all wars ever fought by the country. According to research by Politifact, there were about 1.4 million firearm deaths in that period, compared with 1.2 million US deaths in every conflict from the War of Independence to Iraq. It’s been a while since the last post on this blog – a gap originally forced by a bout of tendonitis which made writing/typing very painful, and then prolonged by a bout of lethargy. Posts will now resume, albeit not necessarily with the same frequency or regularity as previously for a time. I’m considering some tweaks I may make to the appearance and content of the blog for its next season, and will also try to spend some time populating a back catalogue of content, particularly in respect of some of the regular prompts provided by other sites over the past few months. 1. think deeply about something. 2. (of a ruminant) chew the cud. I like to think of God’s people as one church worshipping differently in many buildings, and I long for the churches in my town to co-ordinate and partner together more in serving our community.
. . . if we’re aiming for unity as evangelicals, is it a problem that we are split down denominational lines? Shouldn’t we all go to one Church?
. . . with divergent understanding of scripture, does this merit breaking fellowship, or merely “agreeing to disagree agreeably” within the context of continuing fellowship?
. . . most biblical references to ‘conformity’ are negative, often warning against surrendering to worldly norms, but . . .
“Where do you call me to be? “Lord, let it be as you say. Amen.